Our award-winning jewellery tutor Rebecca Steiner will be demonstrating how to design and make your own pearl necklace, hand knotted onto silk threads. Learn the art of professional pearl knotting and leave with your own handmade pearl necklace or bracelet. £89 per participant, including stringing materials and Swarovski pearls to practice with. Freshwater pearls of various sizes available for purchase on the day (from £10/string). Stringing kits also available for purchase following the class. Email us to book your place, or call 07845642829. Gift vouchers also available if you wish to purchase the class as a gift. Our next event will be an evening wedding fair at Denbies Vineyard in Surrey. A beautiful place to visit year-round, Denbies will make a stunning backdrop for your wedding, and they offer you the chance to see the venue decorated during this wedding fair. As usual, we will be offering free, no-obligation consultations throughout the evening. Measuring your fingers to get an accurate size for your rings, ensuring a perfect fit. Discussing design possibilities and what can be made in a day. Trying on existing designs and/or sketching out ideas unique to you. We will then get back to you with a quote for the material for your rings and to arrange a date for the workshop. We can get busy, so to make sure you have a chance to meet us please email us (using the contact form at the bottom of this page) to schedule an appointment. A consultation takes around 30 minutes, and both partners will need to be present. Last weekend we ran a wedding ring workshop at the beautiful venue of Stanmer House just north of Brighton. The house can be hired as a wedding venue, and we highly recommend it. Beautiful grounds and sumptuous wood interiors with log fires made a stunning backdrop for the workshop. Many thanks to Stanmer House and to all the helpful staff for hosting us over the weekend. We will be back on the south coast for the Seaside Vintage Wedding Fair. Come and say hello! Join us as we return to Brighton for the Quirky Boutique Wedding Fair, ths Sunday 4th October from 11am - 3pm. We will be offering FREE consultations on the day; arrive early to book a slot with us and take advantage of ths offer. This weekend saw us running a workshop at the Red Barn in Lingfield. 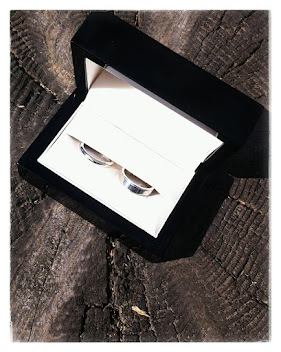 It was a beautiful day for it and the couple, Liz and Emma, produced a stunning pair of shining white gold wedding bands. Theme song for the van - Kitty, Daisy and Lewis singing their UK version of "I've been everywhere"